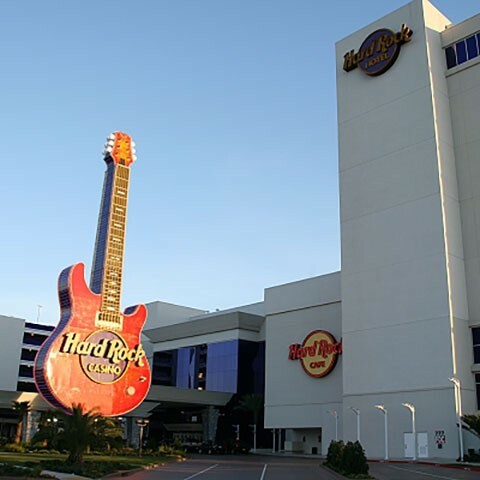 Rock star accommodations are our specialty at Hard Rock Hotel & Casino Biloxi, and you’re the biggest star in the house. Choose from any of the 154 unique non-smoking rooms and suites available in our Platinum Tower or the 325 stylish rooms and suites in our Royal Tower. Rooms in either tower offer incredible views of the city, our world-class pool, and the stunning Gulf of Mexico, and a number of rooms in our Royal Tower are smoker-friendly as well. Have a talk with Lady Luck and head over to wide array of happening table games where the action gets better and the wins get bigger. Make it to 21 in a fast-paced game of Black Jack, or roll the dice at the craps table. Take a spin on Roulette, or enjoy a game of Mississippi Stud in the place where it was born. If you’re looking for something a little different, spice it up with a game of Baccarat, Pai Gow, or Three-Card Poker. Casino offers over 50 tables for you to choose from. So get in the game. Cash in and cash out for hours of endless slot machine enjoyment with over 1,200 of your favorite classic slots, newly released slots, video poker and electronic table games. So take a seat, have a drink, and take the slots for a whirl. The next jackpot could be yours.